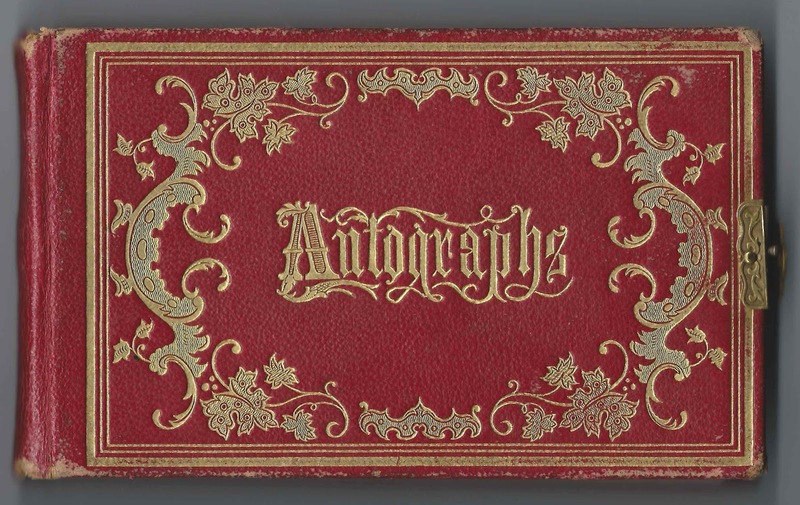 1860s/1870s autograph album containing many pages signed by students at Worcester High School at Worcester, Massachusetts. Sadly, the first few pages of the album are missing, including the title page and any presentation or ownership page that might have existed. 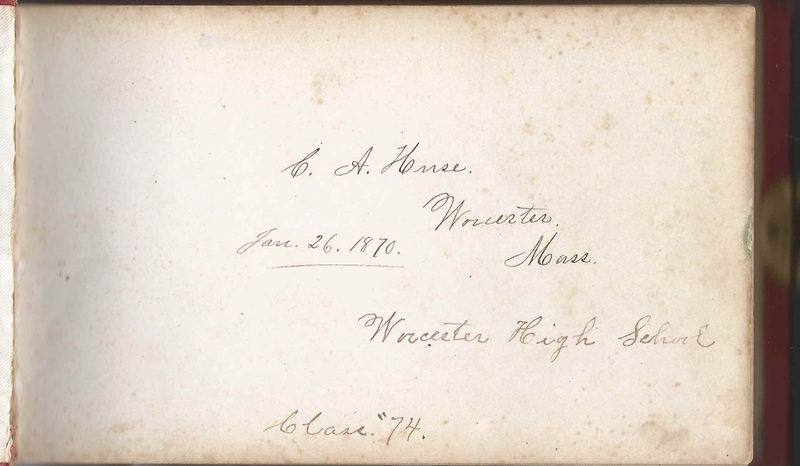 The first page in the album was signed by C. A. Huse of Worcester, Massachusetts, on January 26, 1870 at Worcester High School, Class of 1874, but I don't think he was the album owner. Three people from Oppenheim, New York, signed pages in the album. Could they have been relatives of the owner? L. H. Barker; Melvin E. Barker; and Sarah E. Brown. 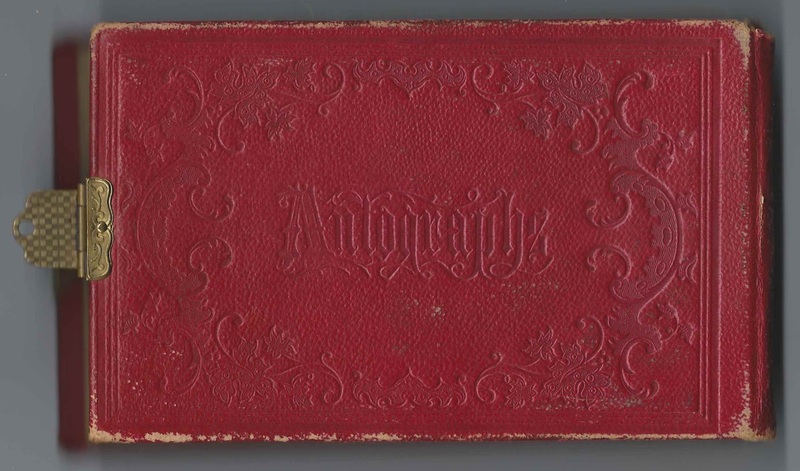 The album is approximately 7" x 4-1/4" and is rather thick, with a metal clasp. It contains 83 signed pages, many of them signed by students at Worcester High School. An alphabetical list of the signers appears at the end of this post, with school/class affiliation noted. I noticed online that Brown University has a copy of the graduation exercises for the Class of 1874 at Worcester High School. If you have information on any of the signers listed below, please leave a comment or contact me directly. Thanks! 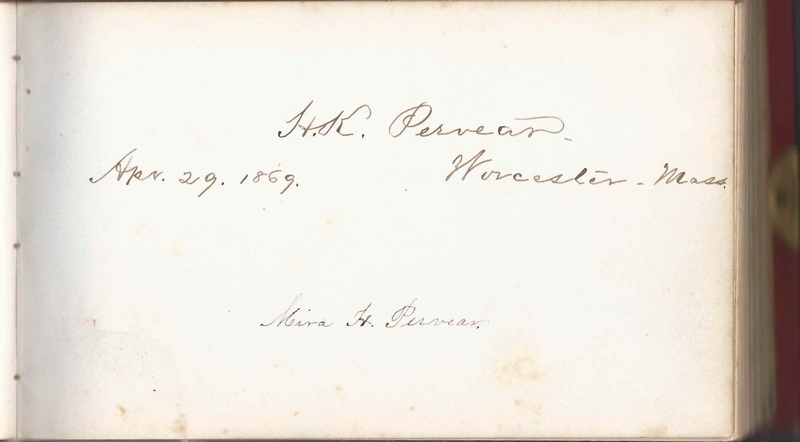 Reverend Hiram K. Pervear and his wife Almira H. Pervear signed a page together on April 29, 1869 at Worcester, Massachusetts. James S. S. Tidd of Westboro, Massachusetts, signed two pages on the same date, November 11, 1870, but in different places in the album. Perhaps he was a special friend of the album owner. 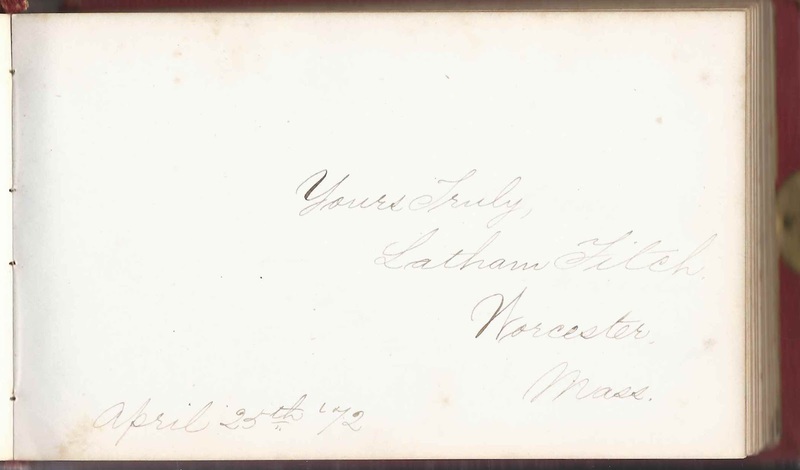 Latham Fitch of Worcester, Massachusetts, signed a page on April 25, 1872. 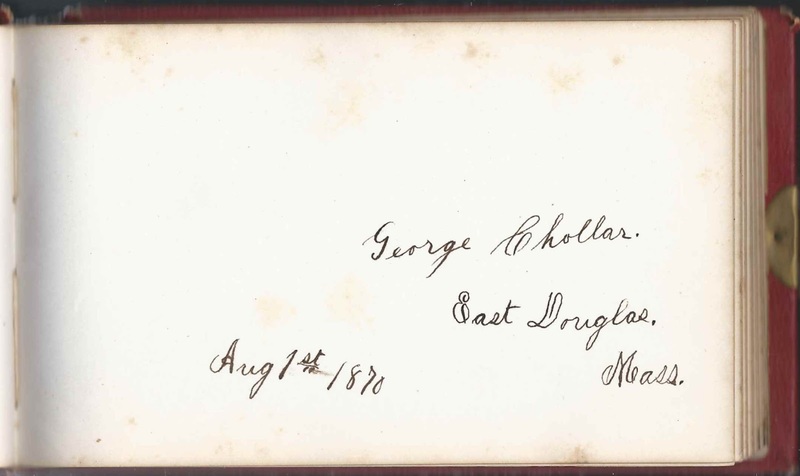 Augusteen A. Buxton of Worcester, Massachusetts, signed a page on November 13, 1870. Records, even his passport application in his own hand, later show his name as Augustine A. Buxton. Augusteen A. Buxton of Worcester, Massachusetts, signed on November 13, 1870. He signed a passport application as Augustine A. Buxton.
? 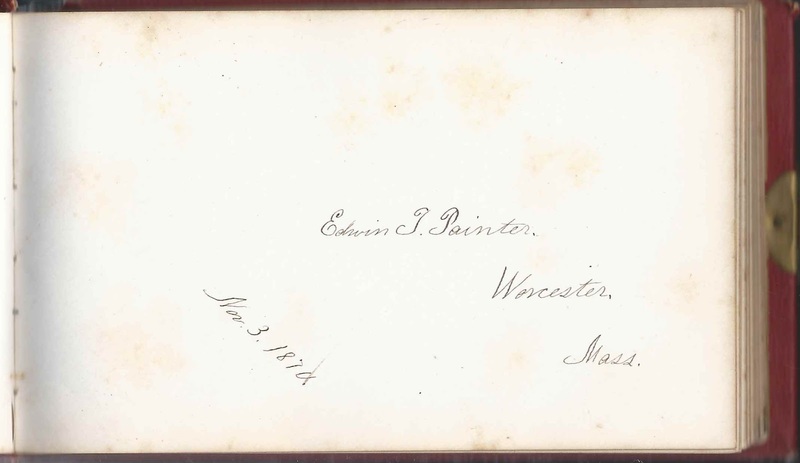 H. Davis, signed at Worcester, Massachusetts, on January 18, 1871; first initial might be A or F or ? Edith F. Houghton of Worcester, Massachusetts, signed on February 22, 1876. H. K. Pervear of Worcester, Massachusetts, on April 29, 1869. He was Rev. Hiram K. Pervear, whose wife Almira H. Pervear shared the page. Mira H. Pervear of Worcester, Massachusetts, signed on April 29, 1869. She was Almira H. Pervear, wife of Rev. Hiram K. Pervear who shared the page. L. Ida Sawin of Worcester, Massachusetts; "19.70.3.10." 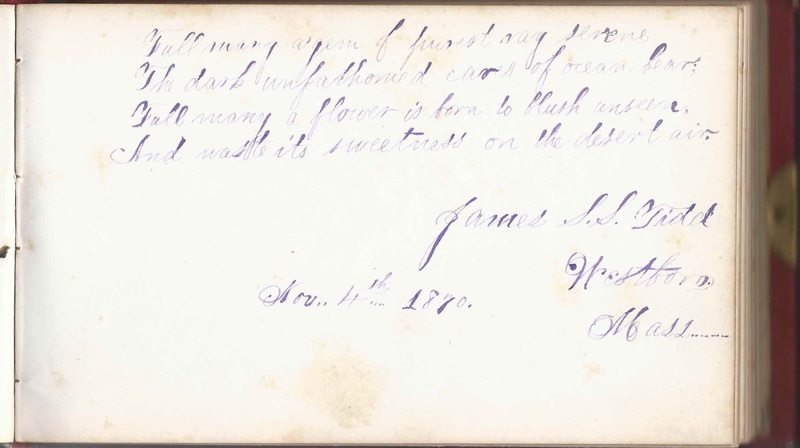 James S. S. Tidd of Westboro, Massachusetts, signed on November 4, 1870; he signed another page as well. Charlie J. Tucker of Worcester, Massachusetts, signed on April 17, 1872. Charles J. Tucker; wrote M.B.S.